How exciting that I get to be the last poster for the Killer Characters June-July giveaway. 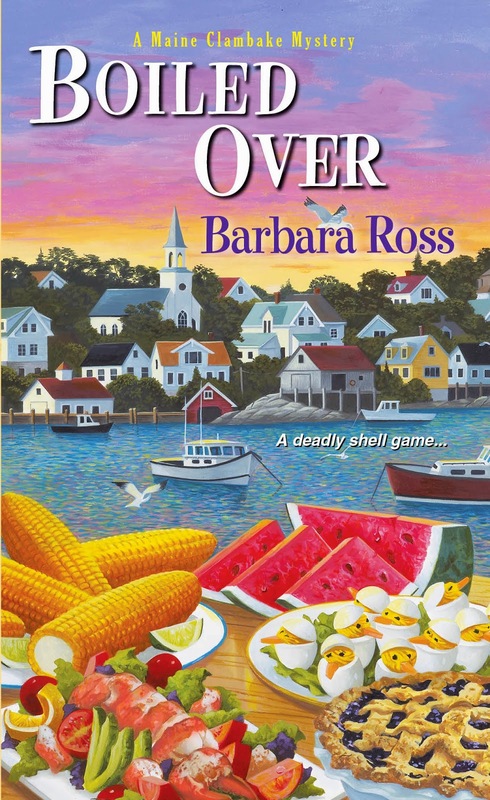 Comment by midnight to win copies of both Clammed Up and Boiled Over, the first two books in the Maine Clambake Mystery series. If you already own both books, say that in the comment and you could win an Advance Reader Copy of Musseled Out, the third book. Fair warning, you’ll find out if you won right away, but you may have to wait until February to get delivery. Summer is high season in coastal Maine. In our tourist-based economy, the citizens of Busman’s Harbor have four short months to make our money. My name is Julia Snowden and this spring, I took a leave of absence from my job in venture capital to return to save my family’s clambake business from the brink of bankruptcy. In the five years since my father’s death, the economy, and my sister’s husband Sonny, had run it practically into the ground. Busman’s Harbor complete with islands, lighthouses, whales, seals and puffins. 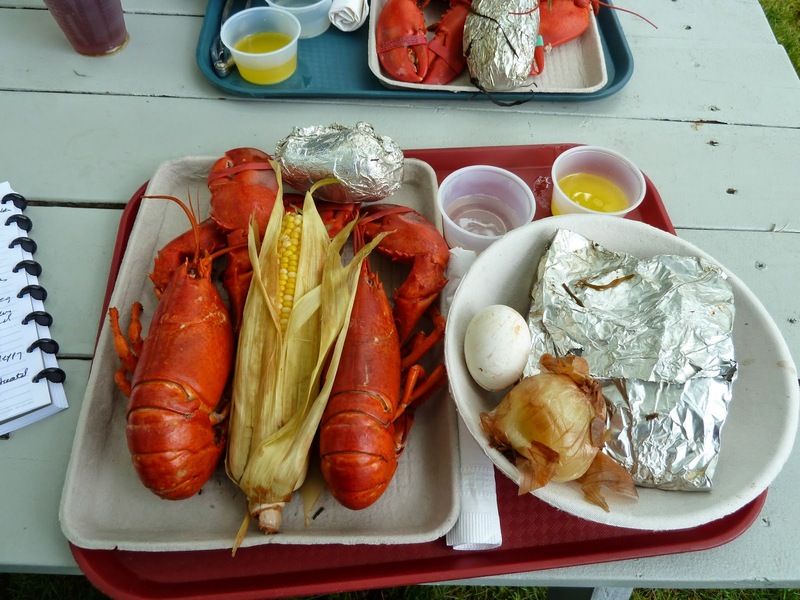 Then we take them to Morrow Island, the private island my mother owns, for a real Maine clambake. After we’ve filled them up on chowder, steamed clams, twin lobsters, corn, a potato, an onion and an egg, all cooked over stones heated by a roaring hardwood fire, we give them blueberry grunt for dessert. Then we load them, stuffed and sunburned, onto the boat for the ride back to town, where we pick up two hundred more and do it all over again. It’s exhausting, backbreaking work, but when I see the happy groups of friends and family, enjoying themselves and our island, it’s all worthwhile. As if all this busyness isn’t busy enough, my sister Livvie signed me up for the Busman’s Harbor Founder’s Day committee. 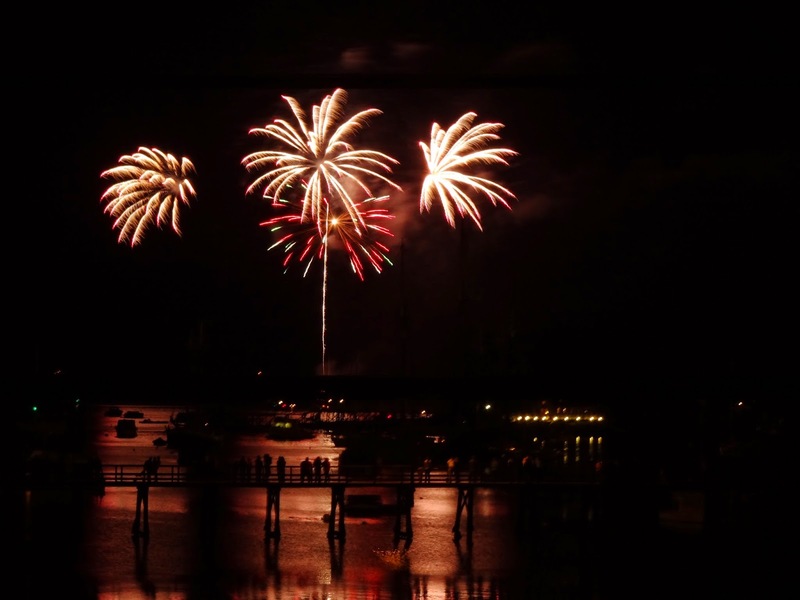 In a couple of weeks, we’ll offer a weekend of fun, including a parade of windjammers, an art show, a codfish relay race, pancake breakfast and fireworks over the harbor. 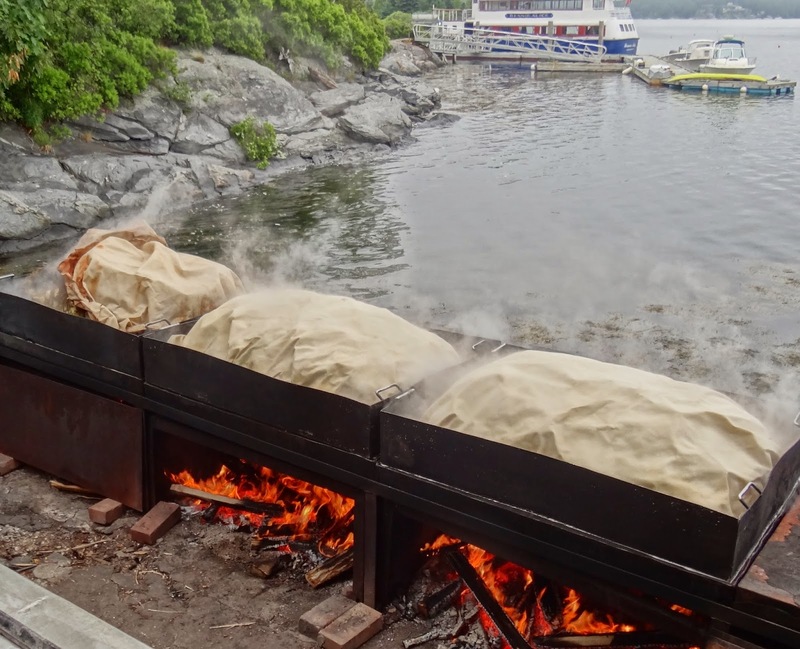 The Snowden Family Clambake Company will serve lunch on the town pier. Sonny’s figuring out how to do that without burning the town down. Fingers crossed it goes well and brings in lots of tourists to help out the local merchants. Honestly, if we get good weather and can manage the crowds, I don’t see what could go wrong. Would love to add Musseled Out to the other two books! This is such a great series and reading about clam bakes in February would be wonderful. I have the first two books and loved them! I'd love to go to a clambake. I'd love the two books! Thanks for all the great giveaways, June & July, Killer Characters! Debra-thanks for the review. There's a quote from your review on the Boiled Over reviews webpage. I'd love to go to a clambake. I've read both of these books and really enjoyed them. Julia is a great character. One of my favorite new cozy series. So sad that this is the last day of the giveaways! Can't wait to see what August brings! Hi Everyone and thanks for your comments. So glad people are enjoying the series. Good luck with the contest! The tour sounds like fun. I've never been to a clambake - here if SF we do tours of the Bay but going to the island sounds great. I do love this series. Have only read 2 of the books. Even though I don't like seafood a trip to Julia's family island sounds like a fun day. I've read both books so far, so I'd love an ARC of Musseled Out. I am so impatient for there to be more books in this series! Wow, Amy! I hope you had a great time in Boothbay Harbor and said hello to the Moore family for me. We are fortunate to have a house in Ellsworth, Maine and lots of friends in Bar Harbor and Searsmont. It's a great state! Sounds like hard work. I'd love to go to a clambake. Sorry to write that I haven't read any of this books. Will have to change that soon. I have not read any of the books in this series!!!! But I'm going to change that! The food sounds delicious, too bad it doesn't come with the book! Would love to win!!!! Clambakes look like so much fun. I have the first two books and have really enjoyed them. Can't wait for the third! Loved both of her books and highly recommend them to everyone!! Not entering the contest, just putting in my double 5 stars worth here!! I'd love to win. They sound great! I have and read the first two book, I loved them both. I can't wait to read Musseled Out, my only problem is I walk away hungry, LOL. I have read that first two books. I can't wait for Musseled Out to come out! OH... A new series to look into. Loved the first two books!!! Can't wait to read Musseled Out!!! The first two made great summer reading. Nothing like a great armchair vacation. Looking foreword to reading the third one and seeing that cliff hanger get resolved. I loved the first book, have the second in my tbr. I love seafood and was so hungry for it reading the story. Lol! Thanks for the chance to win the third! Both look like great book. Love cozy mystery. Oh, I want to be there right now! Some day I will get to the coast of Maine, but in the meantime I will just have to read about it. I've read both books, and thoroughly enjoyed both! We have family in Portland, and they have a place on one of the islands in Costco Bay! You sure have the setting down pat! Hope everyone enjoys your books as much as I did! Thank you everyone. So glad people are enjoying the books. And good luck with the contest. I already own the first two books in this series & I love them! I visited Bar Harbor and the Maine coastline as a child and I have been enamoured with that area ever since. I hope someday to visit again but until then, your wonderful cozy stories give me a warm, fuzzy, nostalgic taste of that beautiful childhood memory. Thanks so much for that! Maine is one my wish list of places to visit! And now, I'd love to read the books too! Thanks! I absolutely LOVE Maine! Can't wait to start this series! Maine is one of the 8 states that I have never visited. Will have to check out this series! Unfortunately, I have a feeling something will go wrong. I have the first book in this series (although it's on my TBR pile), but I'd love the second. Fingers crossed-my last chance to win during this giveaway! cozyupwithkathy at gmail dot com. I would love to own these books. They are on my TBR list. Would love to visit the woods and coast of Maine. It would not matter if I had both or not would still want them, but truth be told I have only read a friend's copy of boiled over. I loved it and have book one and two on my to be purchased list so can add them to my TBR list. Now I will have to add book 3 to the list. So many books so few hours in a day. I would love to read these books. Maine is beautiful. We vacationed in Maine and your book series sounds wonderful bringing back those summer memories! Thx for the giveaway. I absolutely love this series , book three can't be released soon enough !